All dentists will tell you that pulling a tooth isn’t ideal, but sometimes, it’s the best thing to do for the sake of your smile and your oral health. When you come to Times Square Dental for your oral surgery, you have nothing to fear at all. But we know most people would avoid oral surgery if they could. That’s why we want to share some tips with you today about how to avoid oral surgery. If, however, it can’t be avoided, trust your procedure to Dr. Hastings and our highly-skilled team here in Boise, ID. We love when you come to see us for your regular dental checkups and for cosmetic treatments. It’s great to catch up with our patients and to see them walk out of our office with a healthy, beautiful smile they can feel confident about. There are times, though, when you have to come in for more complicated procedures in order to keep your oral health on track. Keeping your teeth and gums healthy means that we sometimes have to schedule you for an oral surgery of some kind. – The way your wisdom teeth are coming in pose potential problems. – You have an infected tooth in need of a root canal. – You need a ridge augmentation or bone graft to prepare for dental implants. – You need one or more teeth extracted. When you’re in our Boise dental office for a routine cleaning and exam, we will carefully check your teeth and gums for signs of existing or potential problems. With our advanced technology and skilled staff, you can count on accurate diagnosis and effective treatment. When treatment is needed, you can also count on stress-free procedures thanks to our options in sedation dentistry. Even though oral surgery at Times Square Dental is a breeze with our gentle touch, cutting-edge technology, and sedation methods, you can still make an effort to avoid oral surgery with these simple tips! Follow the American Dental Association recommendations for oral hygiene. Brush your teeth twice a day for two minutes at a time. Then make sure to floss once a day. This will ensure your teeth and gums are clear of food particles and other debris that might otherwise feed the bad bacteria in your mouth. The last thing the bacteria in your mouth needs is fuel to help it grow stronger, and sugar is it’s favorite power source. If your diet is full of sugary snacks and drinks, you’re giving bacteria that much more opportunity to feed and create acids. Those acids will eat through your enamel, weaken it, and leave you susceptible to infections, decay, cavities, and gum disease. It’s best to drink lots of water and to eat foods high in calcium, protein, and vitamins to keep your teeth healthy and strong. One of the best things you can do for your health is stay active. But this does put you at a higher risk for oral injuries. You can protect yourself by getting a custom-fitted athletic mouthguard at Times Square Dental! As much as we may hate to admit it, we know that avoiding problems doesn’t solve anything. Quite the opposite, actually. It most often makes problems worse. The same is just as true when it comes to your oral health. 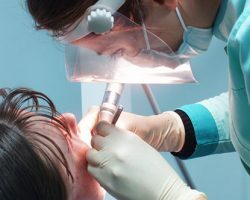 If you’re in need of restorative dentistry but don’t get the dental care you need, you’re only making it more likely you’ll have to come back later with even bigger problems to fix. Keep Up With Regular Dental Checkups! Dental problems don’t always begin abruptly with painful symptoms that get your attention. Sometimes, problems with your teeth and gums don’t come with noticeable symptoms at all. That’s why it’s so important to come and see us at least twice a year for checkups. If we can catch problems early enough, we can treat them effectively. With any luck, we can help you avoid oral surgery. But if you must have oral surgery, you can count on us! Call Times Square Dental at 208-278-1069 or fill out our convenient online form for an appointment.